Pablo Benavente wears a Trump mask along the motorcade route from the White House to the Capitol. 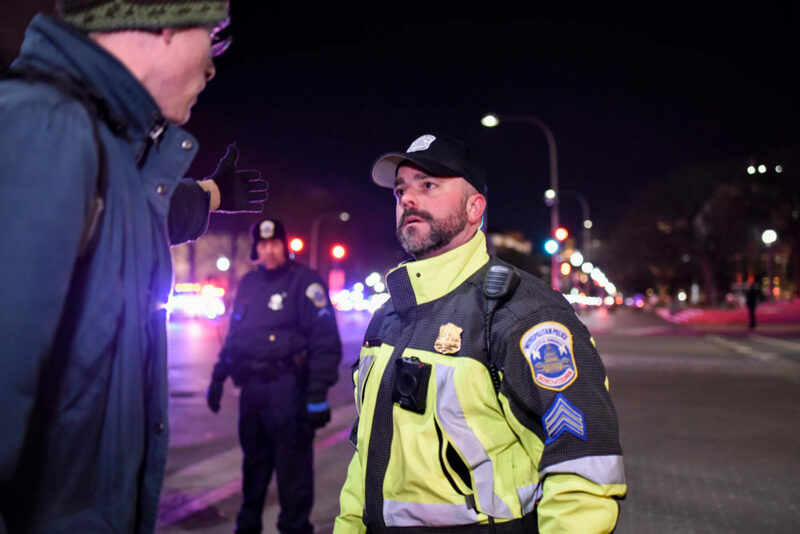 About 200 people waited for the presidential motorcade outside the Capitol Building to protest the State of the Union address Tuesday night. 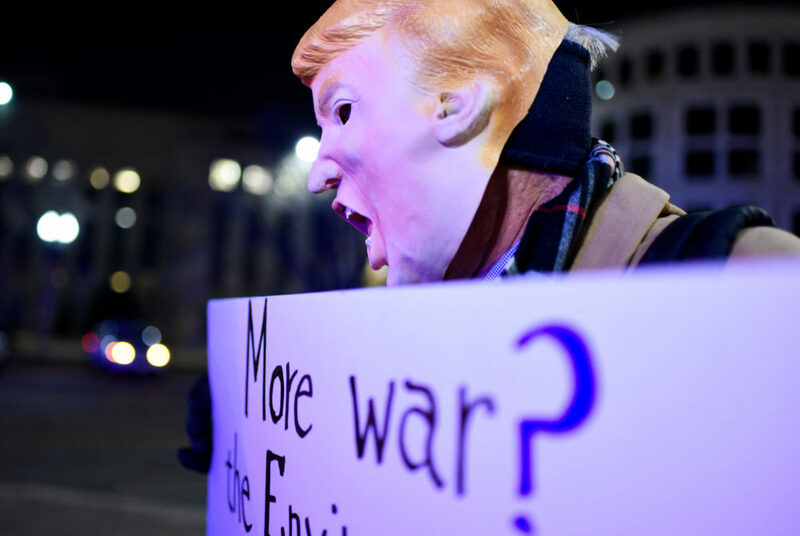 Holding signs that read “Resist Trump,” demonstrators said the goal of the protest was to show President Donald Trump that there are hundreds of people in D.C. that will come out to oppose his administration. The protestors split up between the two sides of the Capitol to make sure demonstrators would be in front of Trump when he drove by in his motorcade. When a motorcade passed by about 10 minutes before 9 p.m., protestors yelled “shame,” recited chants and voiced their support for young undocumented immigrants. Motorcades came down both sides of the Capitol. Morgan Finkelstein, who lives in D.C., said she was surprised to see so many people turned out despite the cold weather. She said she felt an obligation to be at the protest because she lives in the District. Finkelstein said it didn’t matter how “presidential” Trump acted in his speech because his actions and policies speak louder than words. “He says horrible stuff on Twitter and takes horrible action every day, so whatever he says in front of the camera is moot when you look at his actual behavior,” she said. The protest came after several members of the Democratic party said they would not attend the president’s speech, citing Trump’s recent rhetoric about people of color. A Metropolitan Police Department officer keeps protesters from advancing towards the Capitol Building Tuesday night. Students at GW have demonstrated against members of the Trump administration and last semester, five students were arrested on Capitol Hill during a demonstration in support of young undocumented immigrants. Members of the College Democrats planned to attend the event Tuesday. Protesters of all ages chanted and waved signs the hour before the State of the Union address at the event, which was hosted by the anti-Trump group Resist D.C.
Local resident Helena Ikenberry, 14, said although she can’t vote yet, she can still protest. She carried a “Love Trumps Hate” flag and waved it as the motorcade passed. Ikenberry said she really didn’t know what to expect from the State of the Union address but felt proud to see hundreds join the protest. “It made me feel really empowered to see all these people here standing and yelling on the sidewalk and say what they believe to him as he passes by,” she said.